Have that special someone who has everything and don't know what to get them? Stop in at Gunz N Fun and get them a gift certificate and let them pick out what they want. 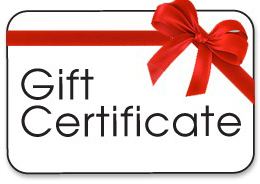 Gift certificates are good for in store purchases of fire arms, ammo and accessories. Nothing says you care more then a gift certificate from Gunz N Fun. Ideal for that person who has been thinking about getting their first gun or someone who has their eyes on a particular gun but doesn't have the funds to buy it.